Featured News: Crowdsourcing asteroid data, student rockets, DIY satellites, and more. Space Makers: Near Space ballooning, European CanSat Competition, student suborbital research, and the UAE's student-built cubesat. Amateurs in Space: Coding space robots and student-designed Alzheimer research. Exploring Earth: Space archaeology in Peru, googling earthquakes, UK crowdsources weather data, Jamaican schools' seismic network, and America's storm-spotter network. Exploring the Solar System: A year of spiders on Mars, Hawai'i as an analog for Mars, Team Indus wants to send student science to the Moon. Exploring Deep Space: UK teens discover Neptune-sized exoplanet and why listening to citizen scientists matters. Outreach, Tourism, and Other News: European Space Agency asks for public's advice, Kiwi astronomy, and more. Near Space ballooning is an affordable way to explore Earth’s upper atmosphere. Hobbyists and schools regularly attach cameras and sensors to high altitude balloons to get a glimpse of Earth’s horizon beneath the blackness of Outer Space. The North Devon Journal reports that a British primary school’s balloon rose 32 kilometers over southwestern England. The local community helped conduct the balloon flight and raise the project’s £600 cost. Community college students in Minnesota sent more sophisticated instruments into Near Space, the Post-Bulletin reports. A set of Geiger tubes let the students measure the rate of cosmic ray impacts as the balloon rose above the atmosphere. They timed their project for last week’s Academic High-Altitude Conference. Scientists, educators, and amateur Near Space explorers gathered to discuss ways to improve the scientific and educational use of high altitude balloons. Spaceflight Insider reported on the student science experiments Nasa launched on a sounding rocket. Nasa’s Wallops Flight Facility conducts the space agency’s suborbital research, launching experiments hundreds of kilometers into space (but not into orbit). Every summer Wallops hosts rocket week a combination of workshops for undergraduate students and secondary school educators. Spaceflight Insider’s report provides details about the rocket and its flight. The rocket also carried eighty small experiments designed by middle and high school students around the United States. Cubes in Space encourages science and math education by giving the students hands-on experience designing space experiments. Undergraduate students in the United Arab Emirates will see their cubesat launch later this year, The National reports. It will incorporate an amateur radio transponder that can relay messages. Unlike most amateur radio satellites, Nayif-1’s software will support messages in Arabic. Middle school students across the United States submitted code to the Zero Robotics competition last week. The teams will refine their code over the summer and compete for a chance to program Nasa’s Spheres robots on the International Space Station. West Virginia schools joined Zero Robotics hope to take the grand prize this year, the Preston County News & Journal reported. Texas television station KWTX reported on the Waco-area middle school students who will sharpen their math, science, and coding skills by programming space robots. A student-developed Alzheimers experiment will ride into space early next year, the Northwest Indiana Times reports. The team consists of Calumet College undergraduate students and area high school students. Their research will study microgravity’s effect on peptide folding, one of the sources of Alzheimers disease. National Geographic Fellow and space archaeologist Sarah Parcak announced that Peru will be the site for her crowdsourced archaeology project. People around the world will get a chance to review satellite images of the Andean nation for signs of the ancient Chimu and Incan civilizations. “We cannot predict what the world will find,” Parcak wrote, “but if the last few weeks in my lab are any indication, hold onto your alpacas.” The GlobalXplorer project, funded by Parcak’s TED Prize will launch later this year. Google search results will present more relevant earthquake news, the Los Angeles Times reported. People often search for “earthquake” when they feel a tremor, but Google’s search results could present general information or news about earthquakes around the world. Now Google has tapped into the seismic datastream at the United States Geological Survey to better understand where earthquakes are happening and present the information that matters most. “We hope that by displaying this result directly in Search, people will have fast and easy access to the information they need to stay safe in the face of an earthquake,” Google explained in its announcement. Great Britain’s MetOffice has upgraded their Weather Observation Website. The site crowdsources data from public weather stations around the world. Since its launch in 2011, people in two hundred countries submitted more than 850 million observations. The Manchester Evening News reported that the MetOffice wants more Britons to submit data to Wow. The more data the weather service can pour into its supercomputers, the more accurate its forecast will become. Schools across Jamaica are deploying seismograph to create an educational earthquake network. Students can monitor the instruments for local tremors and measure quakes on the other side of the world. The scientists and educators behind the project hope the network will improve the island nation’s science education and encourage earthquake safety among the broader public. Martian crowdsourcing project Planet Four: Terrains celebrated its first birthday. More than 10,000 volunteers have contributed nearly 630,000 observations of the Martian south pole. They help planetary scientists study a seasonal phenomenon on Mars called “spiders” that form as the carbon dioxide ice sublimates in the red planet’s Spring. The images came from the Mars Reconnaissance Orbiter’s medium resolution Context Camera. Thanks to the citizen scientists’ contributions, Nasa has scheduled high resolution images with the MRO’s high resolution HiRise camera - just for this project. A team of volunteers isolated on a Hawai’ian volcano simulate a Mars mission, the Christian Science Monitor reports. The six analog space explorers joined the Hawai'i Space Exploration Analog and Simulation (HI-Seas), a Nasa-supported project that prepares for future deep space missions. The project simulation includes a twenty minute delay in all communications - including the Monitor’s interview with architecture graduate student Tristan Bassingthwaighte. Young people around the world have a chance to send an experiment to the Moon. Team Indus is the only Indian team competing in the Google Lunar X-Prize, a race to develop a privately-funded robotic lunar lander. Students between the ages of 14 and 25 can enter Lab2Moon with an experiment that “will help humans build a better world on the Moon”. Registration closes in August. Team Indus will announce the winner in January in time for its planned launch in September 2017. British teenagers discovered a Neptune-sized exoplanet. They joined the week-long Project Tatooine at Keele University this summer to study alien worlds and binary star systems. A few days was all it took for the students to detect the exoplanet circling a Sun-like star in a 19-day orbit. 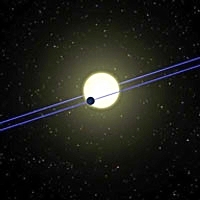 The data came from the public archive for Nasa’s Kepler Space Telescope. "Its been a fun week,” one of the project’s students said in the press release. “I’ve met new people, and you'd never do this anywhere else. And because the information is all public, if I want to, I can now go home and do more research myself, and learn more." The University of Minnesota spoke with astronomer Lawrence Rudick about his citizen science-inspired discovery. Rudick is part of the Radio Galaxy Zoo project’s science team. Two of the project’s citizen scientists spotted something weird in radio telescope images of galaxies. Rudick joined their conversation in the project’s forum. Paying attention to citizen scientists led to a global research project that discovered a rare kind of galaxy cluster, now named after those original citizen scientists. The European Space Agency will conduct a Citizens’ Debate about the direction of European space policy. Events will be held in each of the twenty-two Esa member-states to collect public opinion on six topics. Esa has limited attendance at the national debates to one hundred people, but will provide resources for astronomy clubs and other groups to organize their own debates. New Zealand has more amateur astronomers per capita than any other nation, reports the Gisborne Herald. The new president of the Royal Astronomical Society of New Zealand, a high school teacher and amateur astronomer, explained that the island nation’s unique location and dark skies create many opportunities for amateurs to support scientific research - and to enjoy dark, star-filled skies. Are New Space solutions solving actual revenue-generating problems, asks Crosscut. Nearly $2 billion of venture capital invested in entrepreneurial space startups like the ones attending the New Space 2016 conference. Crosscut interviewed several venture capitalists and industry executives about the challenge these companies face targeting their cool technologies at actual markets. International scholarships have been awarded to let teenagers attend Space Camp near Nasa’s Marshall Space Flight Center. The West reported on Australian student Dean Morris. The New Zealand Herald reported on Kiwi Laird Kruger. The International Astronomical Union, the world’s professional society for astronomy, announced a new grant program for projects that use astronomy to drive sustainable development. Amateur astronomers spoke with the Columbia Business Times about the effect light pollution in Missouri has on their hobby. Scientists with the Faulkes Telescope organized the education and outreach sessions at Great Britain’s National Astronomy Meeting. Their blog post highlights their own talks about using remote telescopes in school science classes and participating in the Gaia Alerts supernova program.